As a freelance consultant, establishing a steady stream of income can be a tricky affair, especially when starting out. However, businesses and practices need a constant source of revenue to unction correctly. Consultancy sometimes involves going through clients very quickly, hence making billing per hour somehow unreliable. However, the solution isn't to have numerous short-term contracts. It's to change the pricing strategy. Billing through a consultant retainer fee arrangement is the better solution. Having a consultant retainer agreement in place means that you will be paid in advance by the client and the client will gain access to your expertise; thus the client will be paying for a dedicated consultant for a particular period, mostly monthly. However, some issues could cause the client to have negative views on agreeing to a retainer fee arrangement. For some clients, they may have had negative experiences in the past, making them wary of working with a consultant retainer fee. 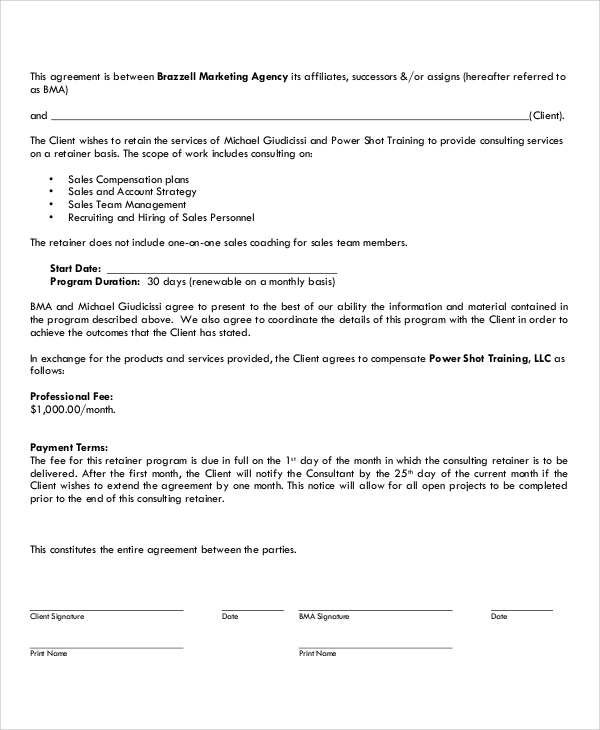 This issue is why consultant professionals fare better when they sell retainer agreements with already established clients. First impressions are vital if you are to successfully market the idea of retainer fee agreements to clients later on. For some others, they could be new to the idea, and thus want to establish that it's a good idea before committing on a long-term deal. This issue can be handled by making sure that your solutions are articulated well during the pitching and signing stages of the business relationship. Also, make sure to include the fact that you charge retainers instead of hourly consulting fees. However, you can offer to cover part of the contract on hourly fees and agree on the services that will require a retainer agreement signed. Either way, you need to earn the client's trust before a consultant retainer fee agreement can be signed. For most consultants, retainer fees are calculated by multiplying the estimated number of hours (hours the consultant expects to work on the client's project) by the amount they charge per hour. For example, when the consultant charges $50 per hour and plans to spend 40 hours per month working for the client, the final consultant retainer fee can be estimated at $2,000. 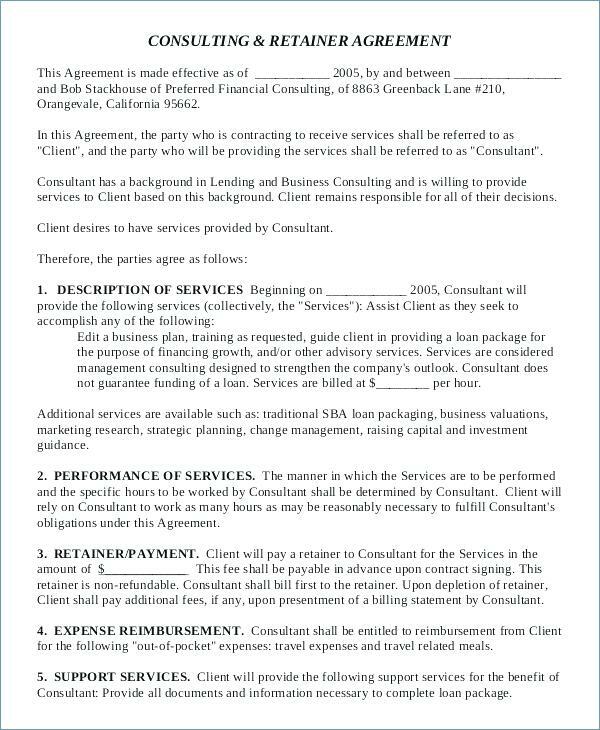 The consultant should make sure that the retainer agreement allows them to earn a profit; otherwise there will be a need to renegotiate the deal. For example, the client could agree to pay more fees, or allow the consultant to spend fewer hours per day on the said project. Some clients will expect a discount when they agree to sign the consultant retainer fee agreement beforehand. This action is unfair to you as the consultant, and thus you should seek to ensure you make a profit from the first stage of the contract. You can opt to offer some package hours at the standard rate. This way, you can guarantee the clients that their needs will have your primary focus throughout the contract. Clients respond more positively to quality service over shoddy work over many free hours. This reason is why consultants are encouraged to focus more on selling quality results instead of hours worked. Maintaining enthusiasm over a long period requires grace. However, it is essential to make sure you remain enthusiastic long after the first month. While new projects are exciting, disagreements and boredom may crop up; the temptation to take your clients for granted should be resisted at all costs. Strive to always offer beyond bare minimum regarding quality services. If you were enthusiastic about providing technical support during the first months, maintain the same enthusiasm regardless of how many months you will have worked hitherto. If the client feels like your enthusiasm wanes after a while, they may feel side-lined and will be less likely to recommend you to other clients in the future. The primary key to successful business relationships is to ensure that trust remains a key pillar. Once the client believes that you can deliver real solutions for the business, they are more inclined to agree to retainer fees agreement.